body_text = body_text & vbNewLine & "<left><p><p align='Left'><font size='3' face='arial' color='blue'><i>Regards<br>" & "Ashish Koul</p>"
bdayimage = "C:\Users\Koul Ashish\Desktop\B'day wishes\img1.jpg"
Thank you Mr. Ashish, the email is created on outlook, but it is not send. Is it possible to send automatically? 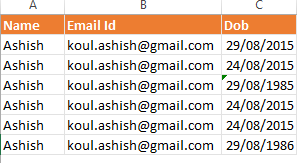 Final question, is it possible to add a dynamic CC email address, so depending on the person of the list it will send the birthday email with cc to a different person. Thanks for the help. I worked for me. I have a query. Can I change the 'From' in the mail?? Is there any way to send random pictures for the wishes..
2. How can I auto run this query including the times when the workbook is closed?